for $329,900 with 3 bedrooms and 3 full baths. This 2,275 square foot home was built in 2003 on a lot size of 0.2200 Acre(s). Stunning & elegant 3 BR 3 BTH great rm ranch in the heart of Wentzville. 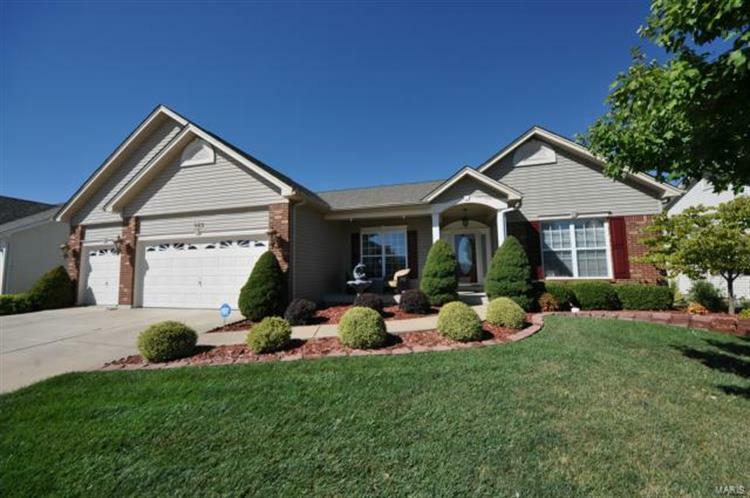 Exterior features a LG deck w/attached gazebo, stone patio & walk, lush landscaping in front & back yards w/irrigation sys provide a beautiful outdoor setting for relaxing outdoors & perfect for entertaining in style! The open floor plan w/12' ceilings will take your breath away as you walk through the entry foyer & gaze upon the formal dining rm w/gleaming HW floors, coffered ceiling & pillar accents. The stylish great rm offers floor to ceiling wall of windows, custom moldings, gas FP flanked by built ins w/plant shelves & HW floor. You'll love the designer kitchen w/custom cabinets, granite counters, stone backsplash, SS appliances, crown, bkft bar & walk-in pantry. Master suite boasts coffered ceiling, walk-in closet & elegant luxury bth w/garden tub. 2 add'l BR w/walk-in closets. Partially finished LL offers a LG family rm & full bth giving you over 2730 SF of living space. The list goes on & on! A MUST SEE!